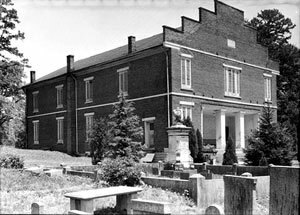 Constructed between 1847 and 1849, Zion Presbyterian Church is built in the Greek Revival style and serves as a landmark for an important early settlement in Middle Tennessee. The church serves the oldest active congregation in Maury County, the descendants of Scots-Irish families who moved to the area from South Carolina in 1807. They purchased five thousand acres of General Nathaniel Greene’s land grant and constructed first a log church in 1807 and later a brick church in 1813. The present building was built of brick and locally quarried limestone. Its Greek Revival-style features include stepped gables and a recessed open vestibule. A slave gallery accommodated the African Americans in the congregation. In 1880 the church was enhanced by the addition of Tiffany stained glass. Church relics include a small registry table made from the original pulpit brought from South Carolina in the initial migration. Pewter mugs, china Communion plates, and Communion tokens marked “ZC” also belonged to the early settlers. The adjoining cemetery contains more than fifteen hundred graves including those of founders of the church and veterans of the Revolutionary, Mexican, and Civil Wars. One such Confederate veteran is Sam Watkins, one of seven survivors of Company H, First Tennessee Infantry. He became famous for his recollections of the war printed in the Columbia Herald and later published as Co. ‘Aytch’ First Tennessee Regiment, or a Side Show of the Big Show. Another notable feature of the cemetery is a monument dedicated to “Daddy Ben,” a slave who survived hanging three times after refusing to reveal his master’s hiding place to British interrogators during the Revolutionary War.